US stocks gapped lower at the open on inflamed Emerging Market concerns that sent European markets tumbling. 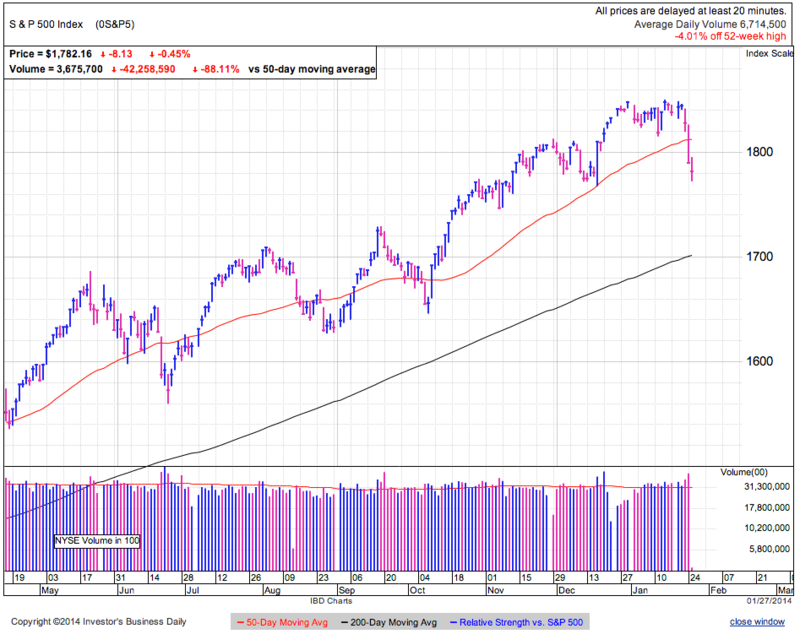 This gap lower failed to breach 1,770 support and the market bounced off those early lows by midmorning. Our markets are jumping all over the place on events happening a world away. The lira, forint, and rand are all under pressure and sending US investors scurrying for cover. If you don’t know what those are, don’t worry, you are not the only one. If US politicians shutting down our govt and threatening to default on our debt was nothing more than a blip on the way higher, why are we allowing currency problems in countries smaller than individual US states to weigh so heavily on our markets? Most investors are not overly concerned about these Emerging Market problems infecting our economy, but they are afraid of other investors being afraid of them. They are not selling based on a shift in their fundamental outlook, they are selling the expectation that other people are going to sell these headlines. Selloffs driven by selling because everyone else is selling are dramatic, scary, and fast, but rarely have staying power. Once the frenzy subsides, everyone wonders how they could have acted so silly. But we are clan animals and through our innate survival instinct, when the clan is nervous, we are nervous. Many global markets were at all-time highs and most investors harbor a fear of heights. They were looking for an excuse to sell and this excuse is as good as any. Recent volatility shook out most owners who were not committed to their positions. Those left standing demonstrated comfort holding this risk and volatility. The more confident the remaining owners are, the less supply we have on the market and the easier it is for prices to rebound. 1,770 is building as a key support level. If there is one thing we know about support and resistance, markets like to breach them before reversing the other way. A quick dip under 1,770 would trigger a wave of automatic stop-loss trading. But unfortunately for those stop-loss sellers, that last dip under support will likely be the final purge before this market overcomes these Emerging Market fears. Are we running out of sellers or dip buyers? Every day the market presents us with two equally compelling scenarios. The market price is the perfect balance point between these two contrasting outlooks. Half the market expects us to go higher, the other half thinks we are headed lower. A dip under 1,770 could do more than trigger one last wave of stop-loss selling, it could trigger another avalanche of emotional selling. The longer we hold these levels, the more likely it is we are near the bottom of this selloff. While we might dip under support at 1,770, that will likely be a quick lived shakeout that purges any remaining excess and clears the way for another move higher. But we do have to be careful about these global headlines. 2008 taught us that on rare occasions, things are far worse than markets fear. AAPL is still struggling with $500 and any hopes for a v-bottom are quickly evaporating as value buyers are not impressed with these new discounts. No doubt Apple is one of the greatest companies in the world and they have unbelievably loyal customers, but with 20% market share in smartphones, they might not deserve to be the largest company in the world. 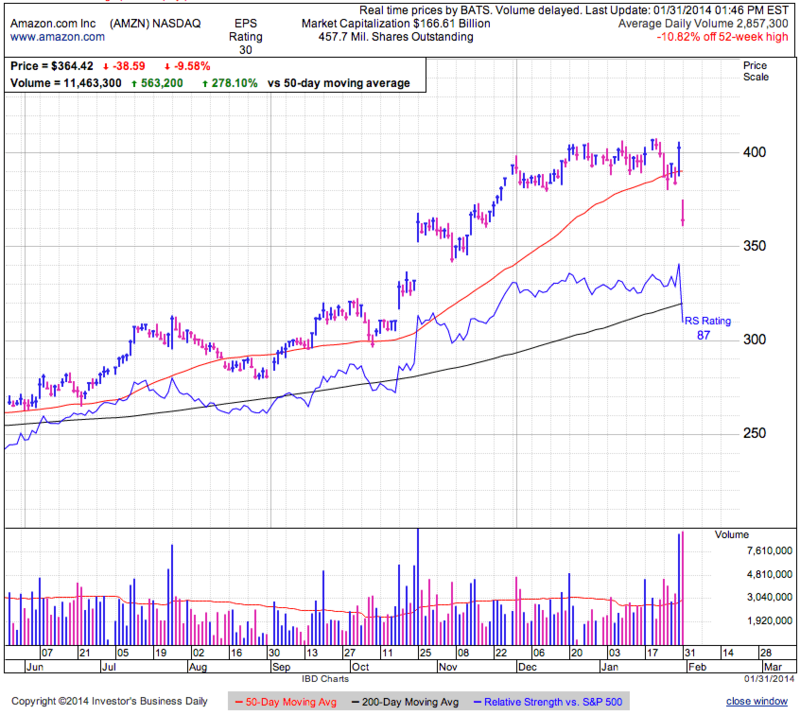 TSLA is adding to recent gains as it tries to recover prior highs. This bounce is demonstrating staying power and the stock will likely breach $200 in coming weeks. AMZN fell under the 50dma on disappointing earnings. 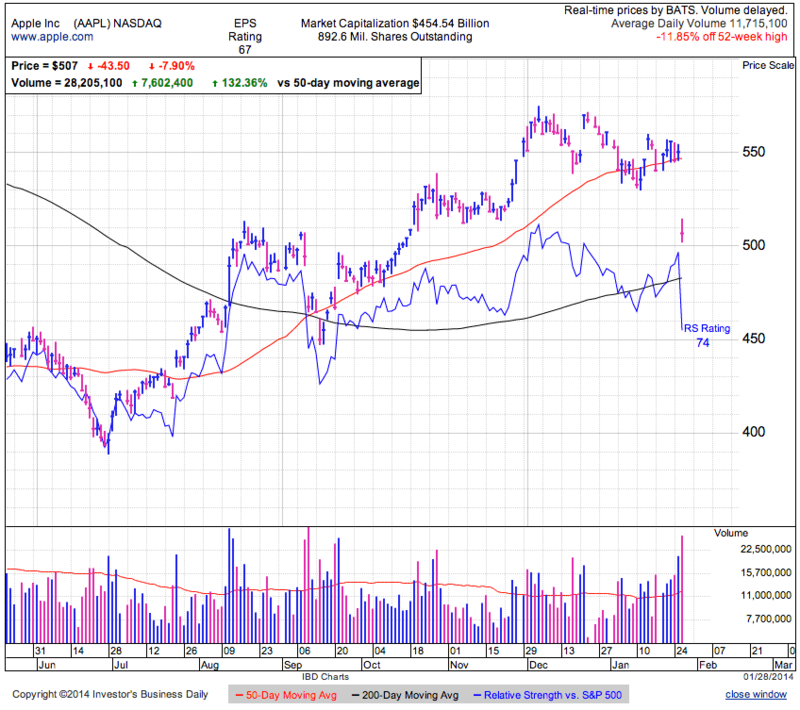 Is this the top everyone’s been expecting in this high-flying momentum stock, or just another dip along the way. To see a larger selloff in AMZN, we need to see a fundamental change in the company’s prospects going forward. AAPL fell on declining market share. NFLX’s most recent collapse came after subscribers fled the planned split of the DVD and streaming business. AMZN will bounce back if the original story remains in tact. Stocks rebounded from yesterday’s 1,770 lows, shrugging off another overnight Asian bloodbath. This is the fourth day the market held 1,770 and likely indicates, at least for the time being, the Emerging Market selloff is no longer a major worry for US markets. With every headline, there are market participants who think it is a big deal and others that are indifferent. Over the last week, those fearing developments in emerging markets sold, fearing this was the start of something bigger. Those that bought from the sellers demonstrated a lack of fear of the same headlines. Anyone holding the dip also showed a willingness to continue owning in the face of these risks. Eventually we reach a point where everyone who is concerned is out and anyone left is indifferent. That is the point where selloffs end. Yesterday’s Fed Taper and last night’s Asian selloff was the perfect invitation for anyone worried about those events to sell. The fact we didn’t selloff indicates there are few worrywarts left in and most holding stocks are comfortable owning these risks. As long as those events maintain the same trajectory, we shouldn’t expect our markets to react since these expectation are now priced in. Obviously if the situation deteriorates, it will trigger another round of selling, but most likely the worst is behind us. Better yet, if the situation turns out less bad than feared, emotional sellers gave us another profit opportunity. Their pain is our gain. The Emerging Market selloff is taking a break and will likely turn into a near-term short-squeeze. That doesn’t mean the coast is clear and we are coasting to 1,900. Stay vigilant and look for the market to trade sideways in the 1,770 to 1,850 range for the remainder of the quarter. There are still risks abound and this might be nothing more than a technical bounce if the Emerging Market situation flares up or January’s employment shows December’s disappointing numbers were not fluke. If buying dips were easy, everyone would be rich. Support is buyable for a swing trade. When the market gets back to the 50dma, we will reevaluate sentiment to determine if this bounce is headed back to the upper end of the 1,850 trading range, or stall and tumble to new lows. AAPL slipped under $500 for the first time since October as dip buyers are still shying away from what bulls claiming is a fantastic buying opportunity. Part of AAPL’s problem is everyone who loves the stock already owns it. Those not already drunk on the Koolaid are wary of the slowing growth and want to see AAPL reinvent another product category before pushing the stock back toward old highs. At this point is seems like the best outcome for shareholders AAPL becomes another MSFT and trades sideways for the next decade. Worst case is it follows the same trajectory as the other hot handset makers, PALM and BBRY. FB shattered expectations again. The IPO darling, turned Wall Street joke, turned juggernaut, shows just how emotional traders are toward high-flying stocks. NFLX is another darling, goat, back to darling story, except this is NFLX’s third trip through the rodeo. Best advice is sell what everyone loves and buy what everyone hates or is afraid to own. Stocks gapped lower at the open on renewed emerging market concerns, but are off those early lows in midday trade. This morning’s dip failed to undercut Monday’s lows and continues trading sideways above support. If we hold this level for a few more days, we might be establishing a wider 1,770 to 1,850 trading range that could last the remainder of the quarter. Several months of sideways trade would go a long way toward refreshing this aging bull. The headline everyone is waiting on is the Fed policy statement due at 2pm EST. I’m not sure what people expect since the Taper policy was explicitly telegraphed last month. Plan on another $10B taper and holding ultra low-interest rates. If that catches anyone by surprise, they are clearly not paying attention. If some are hoping a 3% “crash” in equities or monetary crises in small countries on the other side of the globe will force the Fed to change their carefully laid out plans, they will be disappointed. Of course fundamentals and sentiment are two very different things and we all know markets trade sentiment in the near-term. While we will likely put this emerging market turmoil behind us in coming weeks, that doesn’t mean traders won’t react emotionally to the headlines in the present. It comes down to how upset the market is when Taper marches ahead despite emerging market worries and disappointing December employment. But often when the market responds emotionally to news, that creates profit opportunities for those willing to take the other side. Last year we had a “half-full” market that looked at the positive in every data point or headline. Could these emerging market woes be a sign the market is shifting to a “half-empty” outlook? If we see a fundamental shift in the market’s outlook and disposition, that could signal a reversal in trend. For the time being, four days of selling is anything but conclusive, it is simply something to keep an eye on. Every selloff in history has been a buying opportunity, the only question is how long it takes to show a profit. This time is no different. 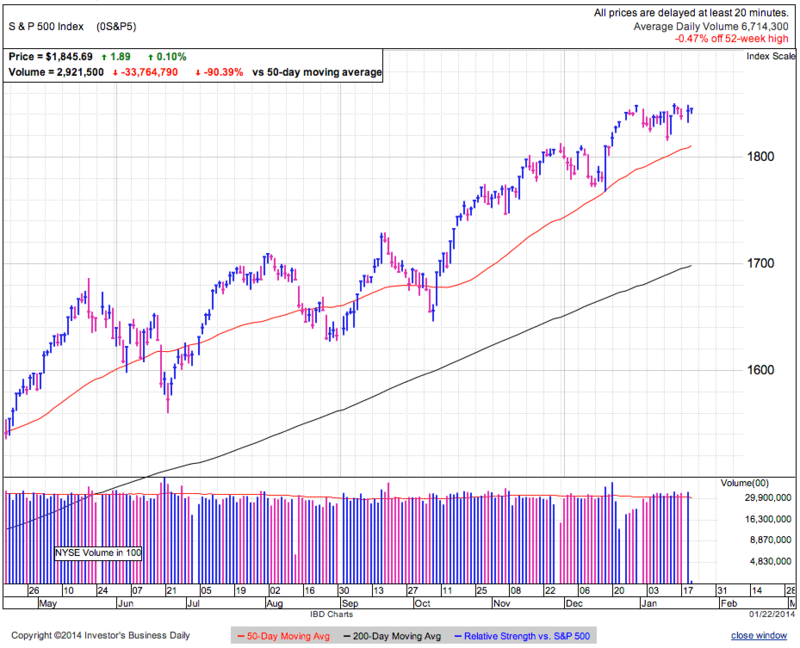 Currently the market is finding support above 1,770 for the third day. We didn’t get a V-bottom like we’ve seen following other dips recently, but halting the emotional selloff is constructive. Buyers are demonstrating a willingness to support the market at these levels and we’ve run out of panicked sellers. 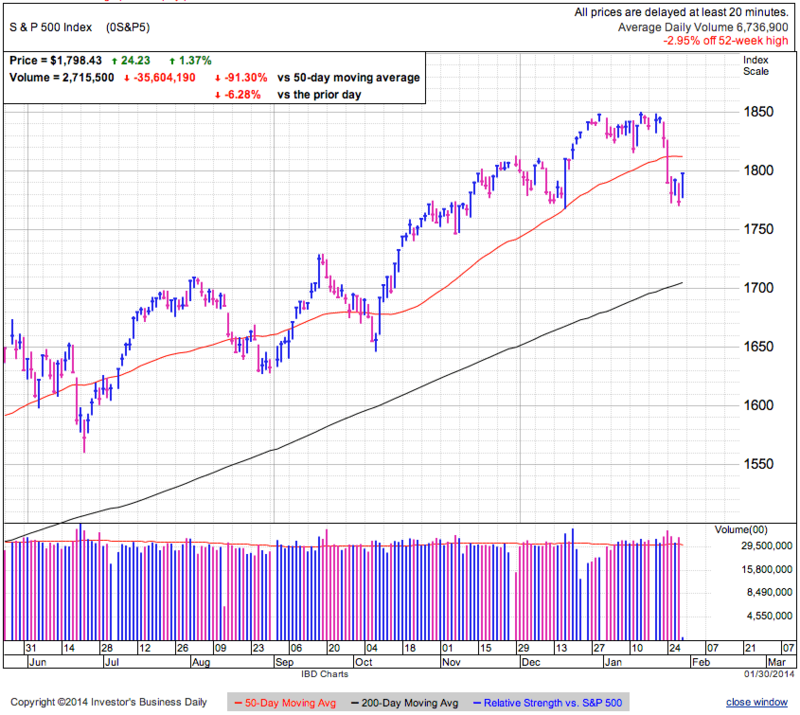 The market is likely establishing an extended sideways trading range in order to digest all of 2013’s gains. If holding 1,770 is constructive, falling under it is destructive. Failing to hold support will elevate anxiety all over again and reignite emotional selling. Be prepared for another leg down if we cannot hold support. Maintaining 1,770 through Thursday is encouraging and suggests we are putting these emerging market fears behind us. Quarters typically have personalities and ending this selloff likely means this one is finding a bottom and setting up to trade sideways. Fail to hold support and all bets are off. Buyers have not rushed in to save AAPL and the stock is down modestly following yesterday’s plunge. Bulls argue that AAPL is a software company not a hardware company, but given the market’s reaction to yesterday’s earnings, Wall Street thinks AAPL is little more than a phone company. The company exceeded expectations on almost every metric expect phone sales. Everyone agrees AAPL built an impressive and profitable ecosystem, but at its core is the iPhone. Take that away and everything else falls down. Maybe the Street is on to something when it focuses almost exclusively on the iPhone sales. Stocks took a break from three days of selling and are up modestly in midday trade. Yesterday we bounced off 1,770 support that comes from October, November, and December trade. The global rout eased as Asian and European markets finished their sessions flat or higher. This took pressure off US markets and we are experiencing a modest relief rally. While it is nice to end the emotional, sell first, ask questions later trade that occurred over the last few days, everyone is wondering if this is just a temporary reprieve before another leg down, or if this is the end of the Emerging Market tantrum. The slide paused as all those who wanted to sell already sold. Now bulls and bears are watching intently to see what comes next. Most weak sellers were purged in the relentless, three-day implosion. Far more bold traders took their place, buying the dip and through those actions demonstrate little fear of this weakness. The remaining group of owners we have to worry about are those formerly confident holders who are now riddled with doubt and paralyzed with fear. This morning’s bounce brings them some relief, but no doubt that anxiety will flare up if prices reverse lower. The recent slide already undercut most stop-losses, so we don’t need to worry about big waves of automatic selling if the slide continues. The biggest risk is a continuation of the pain trade where owners cannot bear the thought of losing any more money and manually pull the plug. While this dip feels dramatic, we must realize anyone holding a widely diversified basket of stocks is most likely still sitting on profits from last year’s monster gains. While theoretically money is a commodity, many traders have a higher risk tolerance for profits than principle. That means most of the longer-term holders are still quite comfortable and the only ones experiencing an inordinate amount of pain are short-term traders and late buyers of last year’s rally. Since both of these groups are relatively small compared to the broad market, their emotional selling can only take us so far. To continue the selloff, we need to flush out longer-viewed traders sitting on nice gains. That is harder to do and a large part of the reason the emotional selloff didn’t last more than three-days or push us down much more than 4% from the highs. Anytime emotional selling takes a break, it is a good thing. This gives owners a chance to regroup and evaluate the big picture. Buyers also often wait for the selling to stall before jumping in and this pause gives them the opportunity to buy at prices we haven’t seen since October. We typically get a couple 5% pullbacks a year. 10% pullbacks are less common and happen once a year or less. 20% pullbacks are rare and only happen every few years. Straight probabilities suggest this weakness is more likely the 5% variety than a 10% or 20% correction. When in doubt stick with the trend and the high probability trade. If buying dips were easy, everyone would be rich. Through most of 2013, we ricocheted off each dip’s low. This rebound is taking its time. Either this is not the actual bottom, or the market’s character is changing. Both of these are concerns we need to pay attention to. Markets rarely implode from the highs, instead they step lower. So while the market might bounce here, we need to be wary of further weakness if the market is unable to make new highs. We only make money by taking risk. Buying dips when everyone is fearful of continued selling is never an easy trade, but more often than not it is the right trade. But at the same time, there are no guarantees in the market and we always need a contingency plan. If the selloff truly stalled and the market is ready to rebound, we should not retest Monday’s lows near 1,772. Dipping under this level likely means another round of pain is coming. AAPL beat expectations on almost every metric but iPhone sales and the stock is getting crushed for it, down about 8%. Tim Cook and bulls point to supply constraints and other issues that lead to slower sales, but Wall Street is not buying these excuses. Most likely investors are frustrated by the lack of innovation. The biggest risk is AAPL’s sentiment transition from great company with explosive growth to rock solid company with above average growth. The nuance is minor, but to the market it is the difference between reclaiming $700 and trading sideways for a decade. Many of the greatest companies in the world traded sideways following epic stock runs. There is no reason to expect AAPL’s stock will be any different. At this point we have dividends, buybacks, product refreshes, and China Mobile, but so far nothing is moving the needle. Wall Street wants another new must have device and the stock will likely trade sideways until AAPL disrupts another product category. 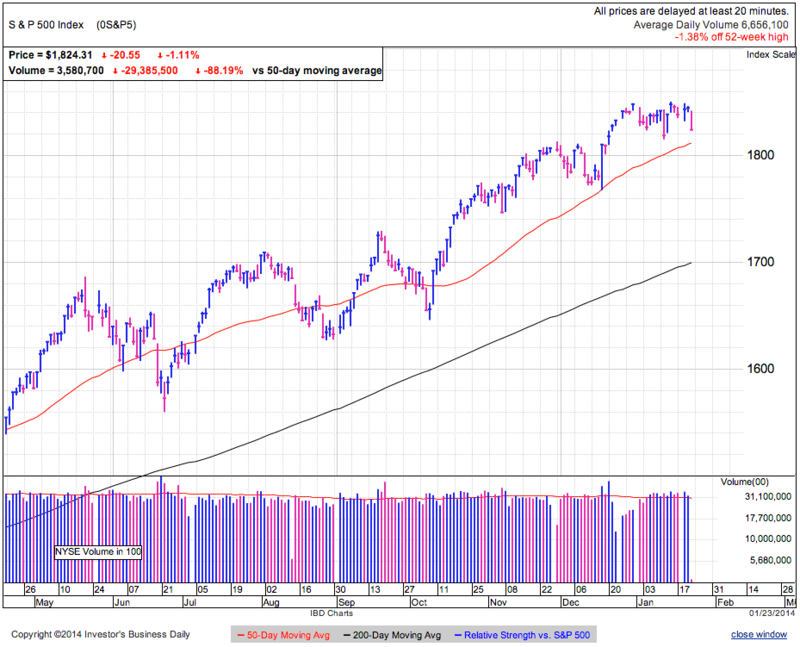 Stocks sold off for a third straight day and are testing prior support near 1,770. Emerging market fears continue embroiling stocks and buyers are unwilling to step in front of this selloff. This price decline is shaking the resolve of previously confident owners and many are choosing to sell this weakness rather than endure the pain of seeing the market fall any further. As rational traders, we need to decide if currency issues in Turkey and Argentina will materially affect the US economy and corporate earnings. In years past we’ve seen our markets tumble over downgrades of US debt and the risks of financial contagion in the Eurozone. Those issues threatened our financial infrastructure and brought flashbacks of the 2008 meltdown. Obviously we cleared those terrifying hurdles on our way to all time highs last year. In the big picture current emerging market issues are far less threatening to our economy and will likely pass through the system even quicker. This selloff is more about sentiment than fundamentals. We should ignore these relatively minor headlines and instead focus on how other traders are responding to this weakness. Most traders are not overly concerned about these fundamental issues on the other side of the globe, but there is just enough uncertainty to make them nervous. Then when they see everyone else panic and run for the exits, it is hard to resist the urge to join the hysteria. Everyone knows markets go up and down, but it is easy to forget that when we see prices tumble. The last three days of weakness has flushed out a large chunk of the excess enthusiasm. Dramatic moves lower chase off most of the holders who are inclined to sell. Those owners still holding are far more confident in their analysis and not interested in selling no matter what near-term moves the market makes. It is on the backs of these confident owners that the market will find a bottom and bounce higher. This periodic purging of weak owners is how markets refresh themselves. Recent sellers and shorts will eventually push the market higher when they buy back in over coming weeks. Everyone wants prices to pullback so they can get in at lower levels, but every time the market gives us what we ask for, many are too nervous to take the gift. Profit opportunities come from volatility and this weakness is exactly what we want to see. Emotional owners are selling at discounts as compared to what they thought stocks were worth last week and that creates profit opportunities for those willing to take a risk. We buy their fear and sell their greed. Every 20% selloff starts with that first 4%. While the market could bounce at any time, there nothing more effective at shattering confidence than a relentless selloff. While these headlines seem unworthy of a large decline, the market rarely does what we expect it to do and if the crowd reaches full-blown hysteria, there is no telling what it could do. Buy weakness and sell strength. Define your risk and take what other traders are giving away. AAPL earnings are on tap after the close. The stock is up quite a bit from last year’s lows and it will take impressive results to continue the recovery. If the company blows away expectations, look for the strength to continue. If bulls don’t get what they are hoping for, the stock will struggle as it runs out of catalysts to justify high growth expectations. This earnings will like set the tone for the next three months of trade, so go with the momentum. Stocks undercut prior support near 1,810 and slipped under the 50dma for the first time since October. 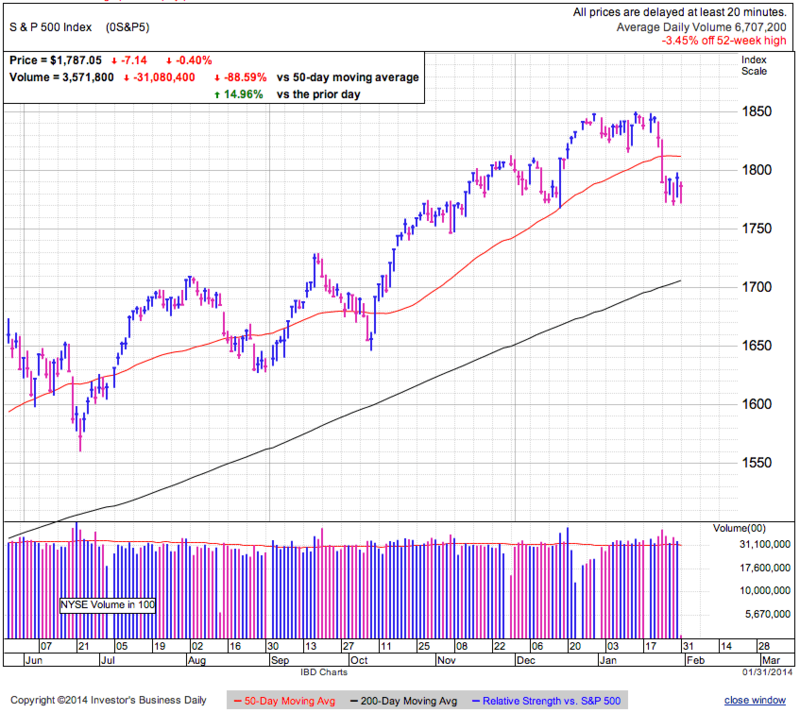 The market is testing the lower bound of the recent trading range after failing to break above it earlier in the week. Markets are nervous following recent Asian and emerging market weakness and this anxiety is flaring up among short-term traders. 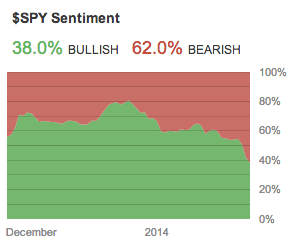 Stocktwits’ SPY sentiment survey has seen bullishness drop from 80% in December to 39% today. Last week’s AAII sentiment survey showed bullishness dip under 40% for the first time since November. What was record high levels of bullishness just a few weeks ago has cooled off dramatically and is a healthy sign. 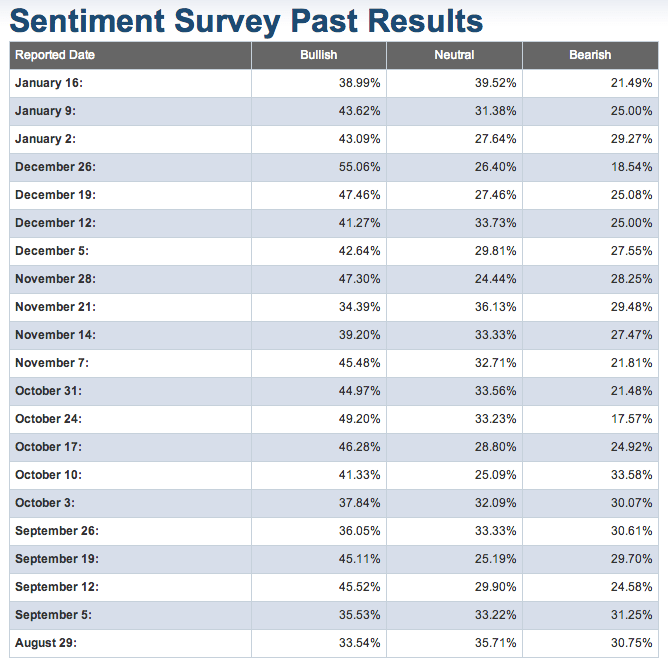 When analyzing sentiment, it is helpful to segregate market participants by timeframe. We have day-traders, swing-traders, position-traders, and buy-and-hold-forever. Stocktwits is comprised primarily of active day and swing traders. This group has clearly grown bearish recently, suggesting many liquidated longs and some have even gone short as sentiment on those boards plunged. We can largely ignore the buy-and-hold-forever crowd since many of these 401k types don’t follow the market daily and a 3% dip over two days is unlikely to send them running for cover. That leaves medium-term position traders. How are these traders positioned and what are they think will go a long way to telling us what will happen next. Many of position traders are fully invested following 2013’s monster run. Last year they flinched anytime the market showed weakness, but every dip turned into a buying opportunity and anyone who sold kicked themselves for being so foolish and weak. After getting burned a couple of times, these position traders learned to hold any and all weakness. When confident/complacent owners hold the dips, they keep supply off the market, making it easier to bounce. With fewer people hitting the sell button, markets don’t selloff as much, and as we’ve seen in recent months, volatility decreases. The headline roiling global markets is Asian and emerging market weakness. Most short-term traders have either been shaken out as the market dipped under their stop-losses, or they used the violation of support as a signal to go short. No doubt a lot of the selling over the last couple days has come from this highly active group of traders. The buy-and-hold-forever crowd isn’t selling, so we can ignore them. The million dollar question is if weakness in emerging markets is enough to shake the confidence and resolve of position traders. These guys held through Shutdown, Debt Ceiling, and Taper as we bounced off those lows. If those significant headline issues that hit close to home didn’t make them flinch, why would a manufacturing index data point on the other side of the world all of a sudden turn them into scared sellers? That’s a good question. 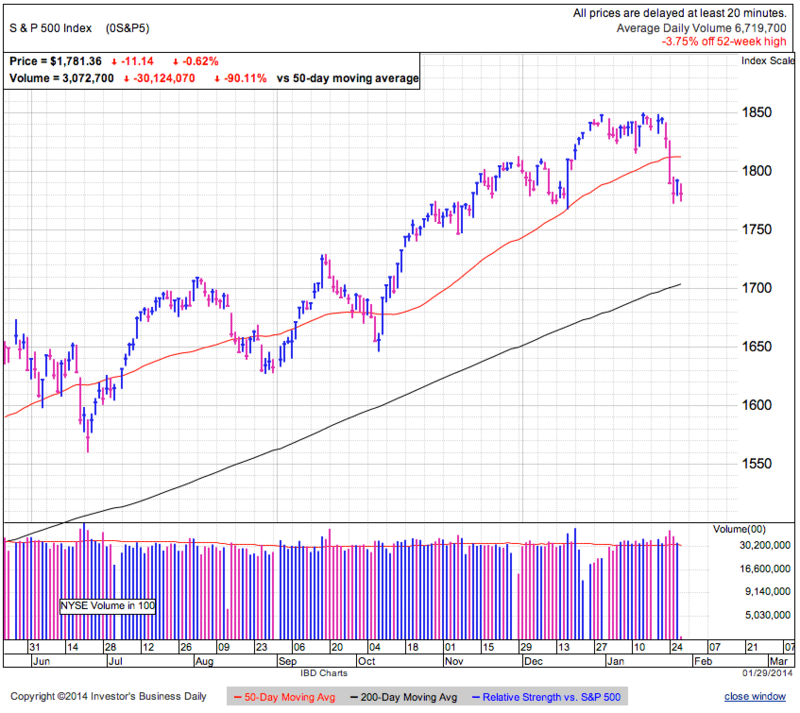 Stocks dipped under support and the 50dma in early trade, triggering many stop-losses in the area and tempting bears to short the weakness. At this point either the selling accelerates as the weakness shatters the confidence and resolve of a wider pool of owners, or supply dries up as we run out of sellers and the market bounces like it has so many times before. Who’s the sucker here, nervous sellers or excited dip buyers? Asian markets have been selling off since December, so why it became big news yesterday is curious. Most likely this was just an excuse for the nervous to sell and the cooling sentiment is a healthy part of moving forward. Dips wouldn’t refresh the market if they didn’t convince everyone this time it is real. Nothing shatters confidence like a screen filled with red. It doesn’t matter why the crowd is selling, just seeing other people sell makes us nervous. This dates back to our days in the wild. When everyone else started running, those that waited around to see what all the fuss was about quickly became lion food. It doesn’t matter if these headlines are legitimate or not, price is truth and emotional selling often leads to more emotional selling. If the recent trading range holds and selling doesn’t accelerate, this is clearly a buying opportunity. Continued carnage in the emerging markets is a real risk, but the best profit opportunities always feel risky. The conservative trade is to wait another day or two for this trade to play out. A trader with a higher risk tolerance can try picking a bottom if the selloff stalls this afternoon. Stocks gapped lower at the open and slipped to 1,825 by midday. 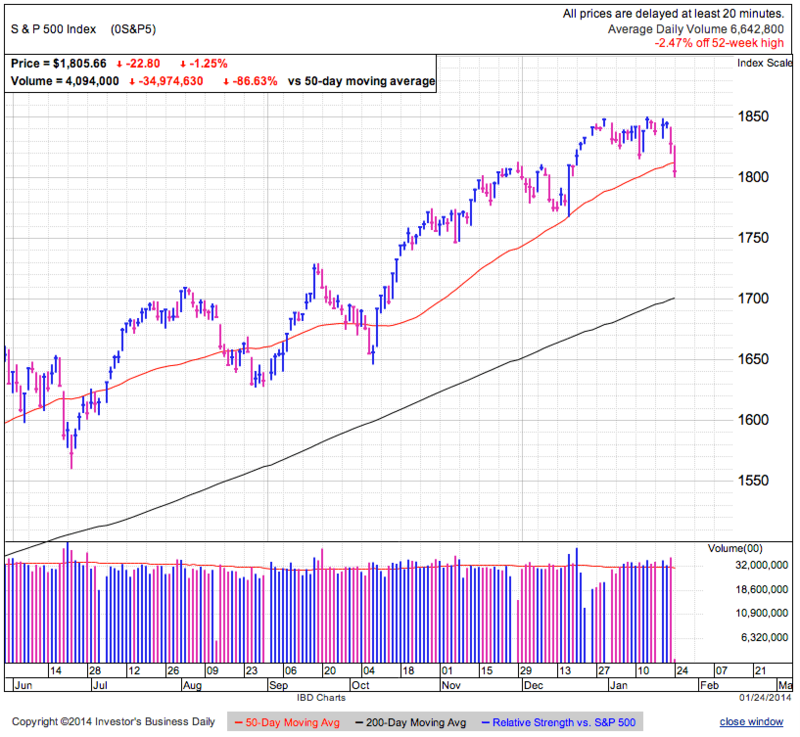 The market is still above recent support/prior resistance near 1,810 and well within the 1,810 to 1,850 trading range. 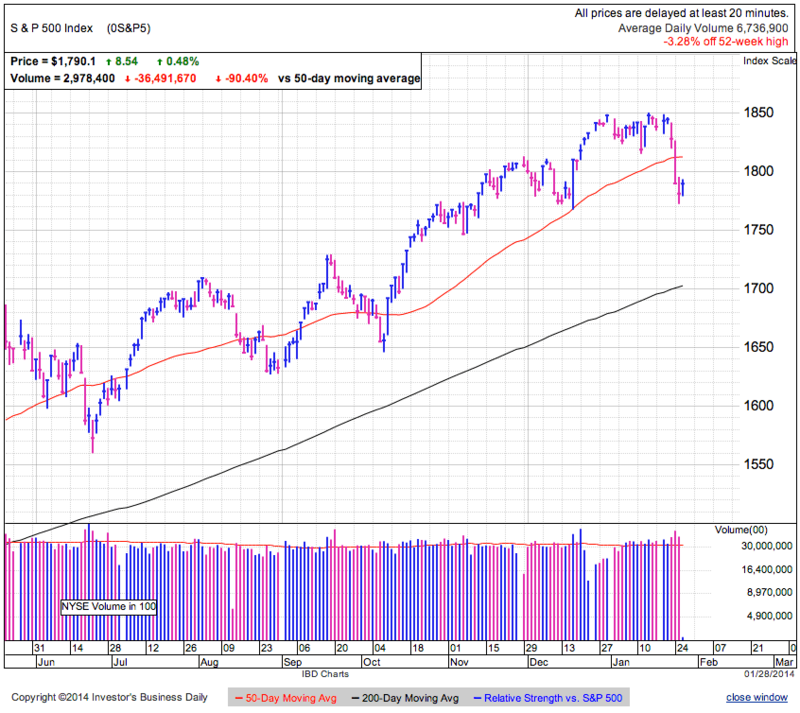 The 50dma continues marching higher and is catching up to 1,810 support. Headlines claim this weakness is driven by disappointing earnings and manufacturing data out of China, but take those explanations with a grain of salt. Journalists are paid to come up with a fundamental reason for every gyrations, whether real or imagined, but the truth is markets often move for no discernible fundamental reason. Over the last few weeks traders have been reluctant to buy new highs and demand dries up each time we approach 1,850. So far this dip doesn’t appear to be any more than a continuation of that aversion to buying 1,850. For a material decline to take place, the market needs to become inundated with excess supply. That means currently complacent owners hitting the sell button. So far they have proven unwilling to sell and every move lower stalls when supply dries up. For the last 12-months each dip has been a buying opportunity and owners quickly learned selling weakness is a poor trading decision. Now they confidently hold any and all weakness, keeping supply tight and making it easy for the market to bounce on modest demand. To see more meaningful and sustainable selling, we need to shatter the confidence of holders and send them rushing for the exits. If the recent announcement of Taper didn’t concern owners, I doubt some footnote about manufacturing in China will all of a sudden trigger a wave of emotional selling. Without a fundamental reason for the market to collapse, today’s weakness is likely another buyable dip. 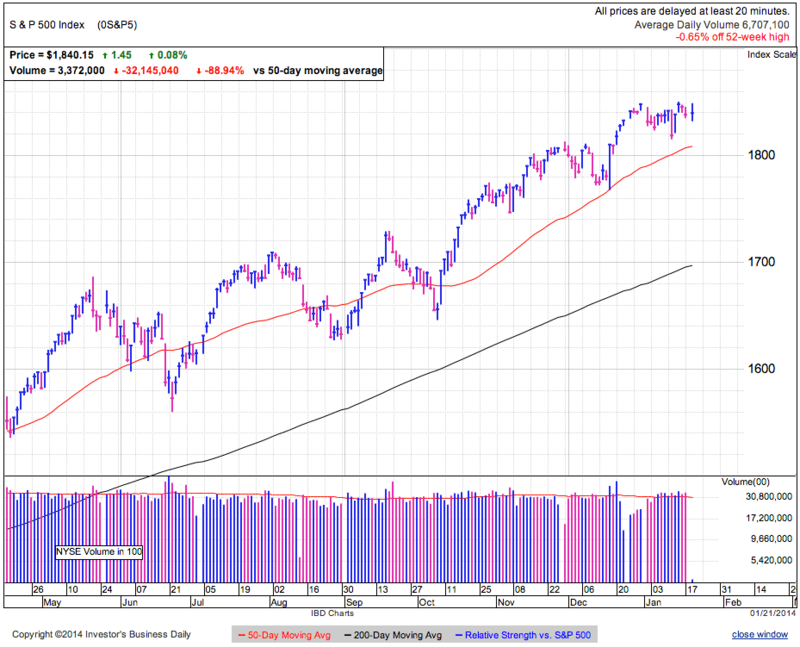 This sideways churn is refreshing the market and setting the stage for the next move higher. Unsustainable markets rollover quickly and holding this levels for nearly a month suggest higher prices are in our future. But the market could dip under recent support at 1,810 in coming days, flushing out the last of the weak hands before bouncing higher. Sometimes markets rollover before the crowd understand why. This happens when the market is most bullish and everyone already owns all the stock they can hold. Without new buyers, prices fall under their own weight. If we slip far enough, previously confident owners turn into nervous sellers. Major market tops occur when the crowd is most bullish and is how this one will likely end too. While it is hard to know when sentiment gets too extreme, price will always let us know with a pattern of lower highs and lower lows. Since we are less than 2% from all time highs, calls of a market top are clearly premature. As long as the market stays inside the trading range, continue buying weakness and selling strength. 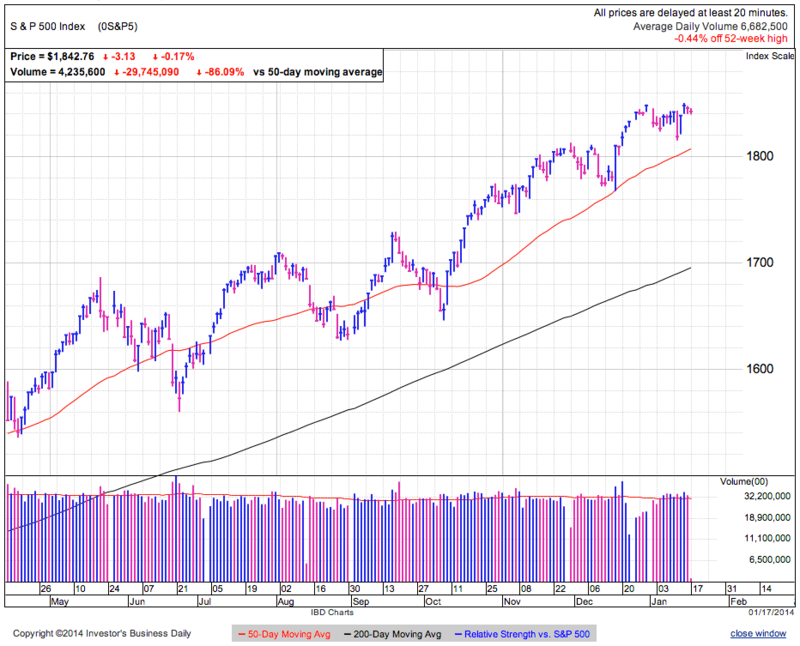 A dip under 1,810 presents an interesting buying opportunity if the market finds support. Stocks are trading sideways in a tight range today as we continue consolidating recent gains. The market remains inside the 1,810 to 1,850 trading range. Many companies have already reported earnings, but few investors are changing their mind based on what they hear. Prices only move when people alter their outlook and make adjustments to their portfolios. So far few traders are buying or selling based on the results companies are posting. Bulls are staying bullish, bears are staying bearish, and those out of the market remain reluctant to chase. Even though we are still early in the earnings cycle, enough companies have reported reasonable results that is it unlikely the back half of earnings seasons will bring any macroeconomic surprises. Obviously there will be big moves in individual companies, but for the most part the fragile recovery is no better or worse than people thought coming into this. In this case no news is good news. Stocks have a natural upward bias and without a reason to sell, most owners continue holding. The resulting tight supply supports prices and makes it more likely the next move will be higher. The sideways trade is wringing out some of the euphoric bullishness seen in December. AAII’s sentiment survey shows the percent of Bulls dipped under 40% for the first time since November. It is also worth nothing that the number of bears is also falling in recent weeks as the percent of Neutrals swelled to the largest level in months. With the self-identified Bulls and Bears, it is obvious what their outlook is and how their portfolios are likely positioned. I don’t like the term Neutral because a person can be an underweight Neutral or an overweight Neutral. When looking for the next market move, it will likely be driven by these Neutrals since the are the most uncommitted and easiest to persuade. Why it is important to know how they are positioned is because if they are fully invested, there is only one move they can make. If they are out of the market, then for the average investor, there is only one move they can make. By itself the Neutral reading doesn’t give us a lot of information directly. But digging one level down, we see bullishness since Dec decreased 16% and bearishness only increased 3%. That means most of the growth in Neutral outlook came from former Bulls. Coming from a bullish bias, that makes me suspect our current crop of Neutrals is more overweight than underweight, especially since we have not seen a gut wrenching selloff trigger a large wave of emotional selling. Most of these former bulls are less optimistic than they were a month ago, but their portfolios likely still reflect a bullish bias. Unsustainable markets rollover quickly and holding these levels for nearly a month suggests a solid foundation under the market. While the a move higher is more likely, with such a high level of comfort and complacency in the market, it is vulnerable to a wave of panic of hitting owners, triggering a mad dash for the exits. So far owners have grown immune to modest selloffs, but be on the watch out for that one event that turns confident owners into nervous sellers. Holding these levels suggests the next move is higher. Long-term investors can continue holding. Bears should avoid shorting. Swing traders can sell strength and buy weakness until we breakout out of this trading range. Stocks stalled following an early assault on 1,850, finding themselves down 15-points from those initial highs. This is the third time the market turned back from 1,850 in recent weeks and this level is quickly transitioning into meaningful resistance. Support lies back at 1,810 and the market is holding within this range as it consolidates recent gains. There is a lot of headline chatter about earnings, but so far traders are unmoved by what they see. Owners keep holding and those out of the market remain reluctant to chase new highs. The resulting standoff is building a sideways trading range between 1,810 and 1,850. 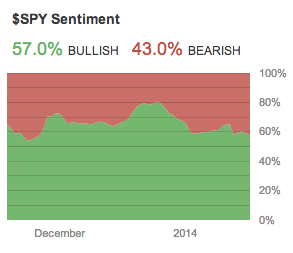 Bullish sentiment is cooling off as we consolidate recent gains. Investors are ratcheting back their wildly bullish expectations as the choppy sideways trade gives them second thoughts. Rallies refresh either by giving up some of the recent gains, or through time. This market seems to be taking the latter approach. Unsustainable markets typically rollover quickly, so holding near record highs for almost a month suggests we are building a foundation for further gains. We are one bad headline away from everyone rushing for the exits. By itself complacency is bullish since confident owners keep supply tight, the risk is if something happens that shatters this confidence. We can continue holding stocks here, but stand near the exits and be one of the first to get out if fear starts taking hold. Inside trading ranges we sell strength and buy weakness. Longer viewed investors can continue holding this complacency as it keeps supply tight and props up prices. Keep a close eye out for that inevitable headline that turns complacency into anxiety. 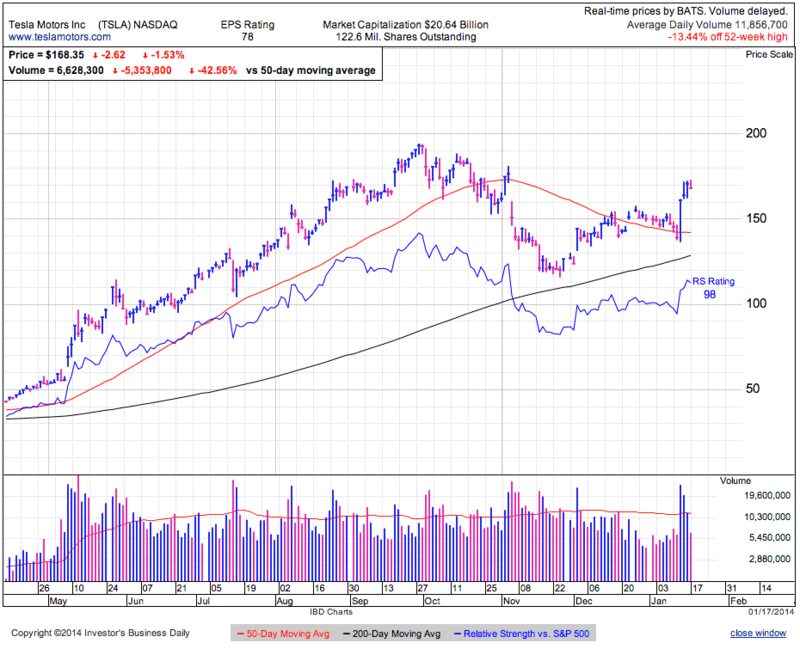 TSLA is adding to its recent high volume bounce off the 50dma. 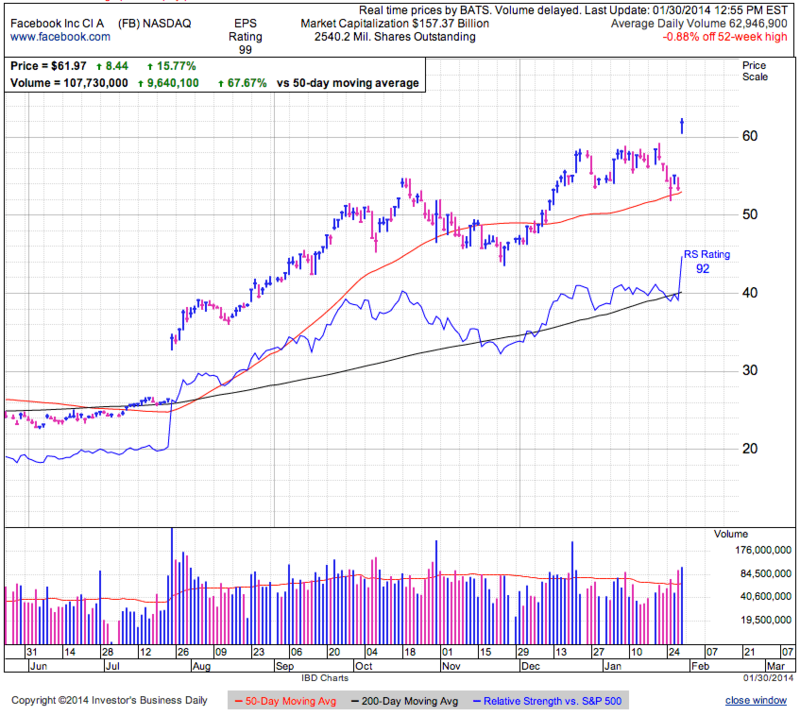 The stock recovered more than half of the recent pullback and is likely headed to new highs. Things that seem too high often keep going higher. AAPL keeps flirting with the 50dma and recovered this level on light volume today. Unless volume picks up dramatically, this bounce is suspicious and not a valid buy point. No doubt most traders are already looking forward to next week’s earnings and we will likely trade sideways until then. It will be interesting to see how the refreshed iPad sales fare. The biggest risk to sales is satisfied customers who see little reason to upgrade from a perfectly usable device. Stocks were down modestly for a second day following Wednesday’s record highs. 1,850 is acting like resistance as the market consolidates recent gains. The 50dma continues its ascent higher and is over 1,800 for the first time. Bullish sentiment is cooling off following Monday’s sharp selloff and a fear of heights is creeping in. 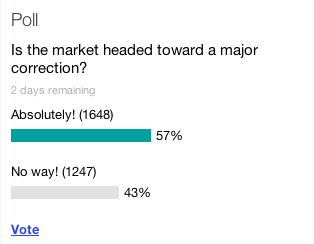 A recent Yahoo Finance poll shows 57% expect a major correction and Stocktwit’s SPY sentiment gauge is down 20 points since the December highs. Even in the face of a shifting outlook, we continue holding near record levels. Markets refresh one of two ways, through a pullback or alternately sideways churn. So far sideways churn is doing a reasonable job taming the euphoria. Nervous owners are selling a fair number of shares as almost every day this year has seen above average volume, but so far there have been plenty of new buyers willing to step in at these levels. If the market continues higher, expect many of these recent sellers to chase the market and buy back in at higher levels. The one big concern is the lack of concern. By nature the market is a worrier and since we cleared the Debt Ceiling and Taper fears last fall, there hasn’t been anything to fret over. Is this the calm before the storm? With so few worries priced in, the market is vulnerable to a panicked rush for the exit if it gets caught off guard. Both traders and investors should embrace the selling as an opportunity to buy discounted shares. It is nice to see our accounts grow every day, but the big profit opportunities come from volatility. While most people come to the market with predictions of moves higher or lower, we trade sideways far more often than anything else. So far the market appears to be establishing a trading range between 1,810 and 1,850. We will likely bounce around this range until traders get bored. Only after they stop buying the breakout or selling the breakdown will we get the next move. With the market so happy-go-lucky these days, it is hard to imagine a headline that will trigger a surge higher. The downside is a far different story. Complacent owners can turn into panicked sellers at the drop of the hat. The last time we saw such bullish sentiment was back in 2011 prior to the US Debt downgrade plunge. Without a doubt we are skating on thin ice and vulnerable to a selloff, but we need that catalyst to break the ice before we fall in. Until then the party continues. Near the upper end of the trading range, there is not a lot to do. Those out of the market can wait for an upside breakout, swing traders can lock-in recent profits, and buy-and-hold types keep holding. Without a doubt we will dip under 1,800 at some point this year, the only question is when and how high we go first. It is easy to predict the market, but all the money is made in getting the timing right. The China Mobile deal hasn’t been the catalyst many AAPL bulls expected. So far it seems more of a buy the rumor, sell the news story. While the stock is up huge over the $400 lows of last year, last year’s catalysts failed to reignite the growth story. It is still a great company with a strong balance sheet, but companies like TSLA and GOOG are doing a better job of capturing the imagination of growth investors. 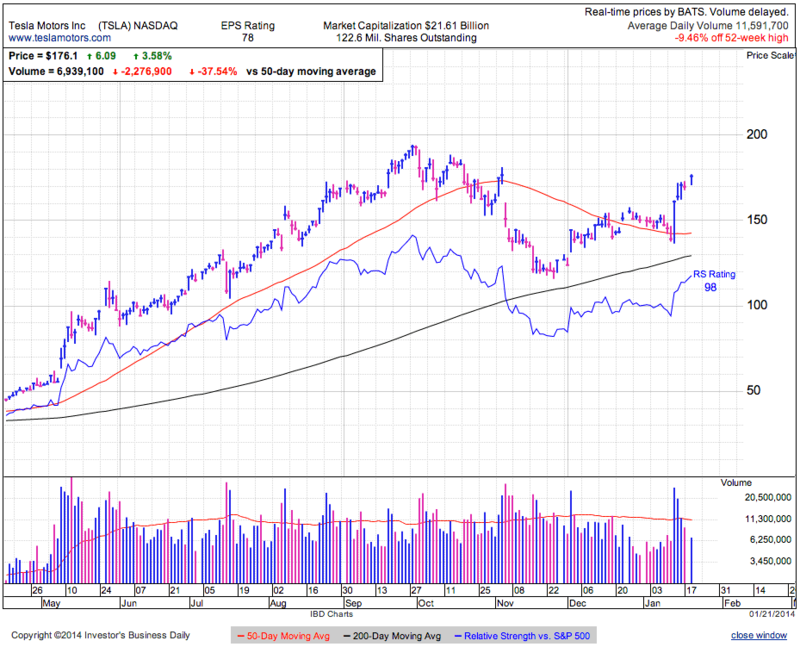 TSLA‘s huge bounce off the 50dma on Tuesday might have created an interesting entry point for the most aggressive momentum investor. The huge volume suggests a lot of traders are onboard this rebound. Expect volatility to persist, but if this bounce holds, we will likely break $200 in the not too distant future.